Two boys!? Are you crazy? And, we’re back! I have determined it is much easier to blog about children you don’t have yet but desire terribly, than it is to blog about the ones you have and must clothe and feed daily 🙂 That being said, I’m overjoyed to be on the “busy doing” end of the spectrum where time and energy to blog are diminished, but the laughs and messes and kisses virtually wipe out all memory of the “busy waiting” phase. Anyway, Glory had her first day of school! But this statement requires explanation. In December Saige started talking to Miss Betsy, our developmental therapist, a skill she had been hiding from Betsy for months. This led to Saige being dismissed from First Steps developmental therapy. Shortly thereafter, she met all the goals set for her by Miss Kendra, the physical therapist, which meant she was done with PT as well! Betsy and Kendra continued to come provide therapy for Glory up until the week before her birthday, February 24, at which point Glory aged out of First Step services. In order to receive speech and physical therapy, Glory now attends the school system’s developmental preschool which by God’s grace is housed at the elementary school that Emet attends. She is enrolled in the afternoon class, which is from 11:40am to 2:30pm Monday through Thursday. 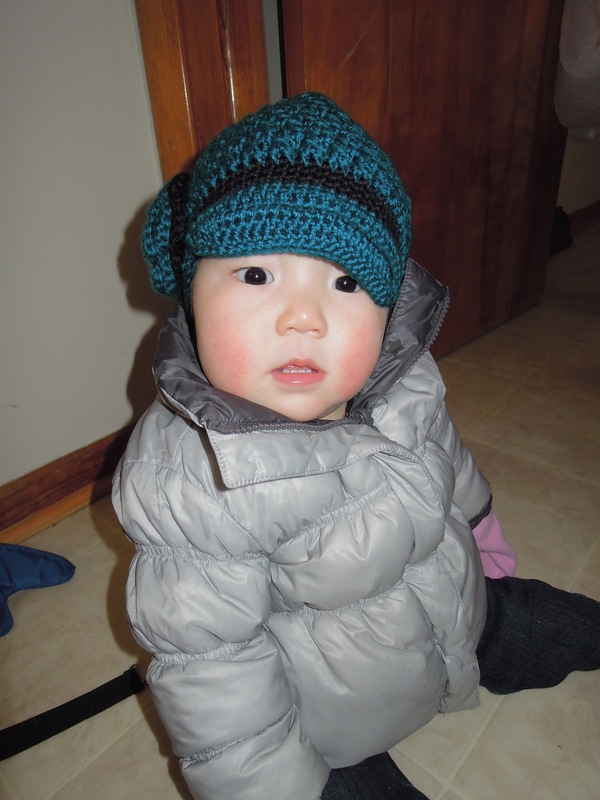 Jamin has been attending Little Seeds Preschool, which is not far away, but begins at 11:45am and ends at 2:15pm, MWF. So, we made the difficult decision to move him to Parkside as well for the remainder of Pre-K. This means that on M-Th, Parkside has 3 Magnuson kids, and I only have 1! It is so weird. Both Jamin and Glory started at their new school last Monday, on Glory’s 3rd birthday. Glory loves going to school, and is wasted by the time I get her home. She tries telling me a little about it, but it is difficult to understand when I don’t have much context to go on. Jamin seems to like his new class alright. He misses his friends at Little Seeds, and sent them a letter last week. He isn’t talking about any friends in particular, but he loved the dental unit they did last week and came home with some cute crafts. For me, this new system is working out well. Saige gets to talk to me all she wants and more 😛 She wants to know when she gets to go to school, but is content to do the grocery shopping alone with Mommy. Hopefully we’ll get used to these changes soon and incorporate some play dates into our schedule! Jamin, ready for his first day! Something happened yesterday. Glory decided to walk! We’ve known she could for a while now. We could feel how strong and stable she was becoming, but she just wouldn’t walk without holding on to someone or something. She’s been tearing around with her baby stroller, and can even hold the hand of a limp puppet while I hold its other hand. But until yesterday, the most she would take was a step or two on her own. Then, while I was in the church nursery with her, she walked on her own. She would get a book from the shelf, turn around, and take the 4 or 5 steps to bring it to me. We’d read it, and she’d walk back to the shelf for another book. When church was out, we went upstairs, and she walked to her daddy. Then she walked to our pastor. Then she started letting go of my hand herself to take a few steps toward wherever she wanted to go! We are so, so proud of her! And she is proud of herself! When she woke up this morning, she wanted her shoes on right away 🙂 She isn’t to the point she is walking exclusively, but we know that will come. Wow, God has done great things in this little girl! Summer is flying by! With Emet starting school on August 5, we’re fast approaching the end of it! In this season we have seen many changes in our girls, and we are so encouraged. Glory and Saige have been receiving therapy through First Steps for three months now- one hour each of physical therapy (PT) and developmental therapy (DT) each week. Our PT recently recommended Saige reduce her therapy from 4 times a month to 2. Each week she comes, our PT is encouraged by Saige’s progress in holding her head up and level, turning her head easily to the left as well as the right, and gaining strength in her trunk to support appropriate movement. Each week our PT tells us Saige is better than the previous session, I have to give praise to God because only He and I know how little I do the appropriate stretches with her! We try to incorporate strengthening exercises into play, but still it seems that her progress is disproportionate to the amount of work I put into it. Rather, it seems more likely that her advancement is the result of the prayers of faithful men and women of God, who often lift up our girls and their health issues before the Great Physician. I praise God both for His people, and His healing hand! Glory continues to receive PT 4 times a week. This little girl is astounding. While she had her bandage on her arm from hand surgery, she took to scooting on her bum across the floor, but since it has come off (on June 11), she’s been working back towards a crawling position. Her arms are still rather weak, but she will get up on her knees and elbows to crawl a bit. Sometimes even voluntarily! More and more I see her sitting on her knees and leaning on her hands, like she’s going to take off any second! Over the last weekend, Glory pulled herself up to standing in her crib, and yesterday she pulled herself up on the coffee table. Prior to this she would whimper and whine about being left to lean on the coffee table herself, and I never even suggested she stand in her crib. She loves to ‘walk,’ holding onto our hands for support, which prompted our PT to move forward with leg braces. Glory was measured 2 weeks ago, and will probably be outfitted with this new hardware sometime next week. We’re still waiting for insurance to approve her lip surgery…. DT happens on Wednesday afternoons, and is like a little breath of fresh air for me. The girls love their DT (and their PT, for that matter! ), and plop themselves down in front of her, ready to see what toys and books she has for them in her bag. She works mainly on vocabulary building, so there’s lots of playing, repeating, and modeling. While our DT is there, I can sit in the background and get laundry folded, do some meal prep, and occasionally reply to emails! The girls seem to be more focused with fewer distractions, which means it’s helpful for the boys and I to clear out! Glory is trying to repeat more and more words. Yesterday, she told the DT, “No,” she did not want the DT to count the puzzle pieces as Glory put them away in their bag, Glory wanted to do it herself! So the DT let her make an “uh” sound each time she put a puzzle piece away, as though she was counting. Saige, well, Saige is now a regular jabber box. She uses around 50 words, and I’m hard pressed to say something she won’t understand. It is amazing! Recently she pointed out the window where the sun was shining and said, “Outside. Light on.” One day she pinched the flesh of her palm in the door so that she was stuck until the door was opened. She whined a little to get my attention, but when I asked her what was wrong, she stopped and said, “Door.” So I opened it, released her, and she went on her merry way. Another day, she was playing with her baby doll, tapping its toes together while she sang, “Toes, toes, toes, toes.” Then she stopped, bent down and touched her toes, yelled, “TOES!” and went back to singing and tapping the baby doll’s feet. She is full of surprises, and repeats words like a parrot. All this after only 6 months of exposure to English. I think we may have a little linguist on our hands! During therapy, the boys are usually redirected to another part of the house where they are less likely to distract the participants. They’ve really handled this well, and content themselves with playing with the therapists’ toys after the session while she is writing up her notes. It was a real blessing for them to spend the latter part of June and early part of July with their grandparents in Colorado where they got to do “big boy” things, and life did not revolve around baby girls, therapy and medical appointments. I know the blog has been a little quiet, but life is certainly not! Thanks to those who pray for our family, whether you know what is happening or not! Over the past week we celebrated some firsts and some lasts. Emet and Jamin had their last days of preschool last week. For Emet, it was the last of his ‘career!’ This fall Emet will enter the realm of public school as a kindergartner, while Jamin will return to Little Seeds for pre-K. 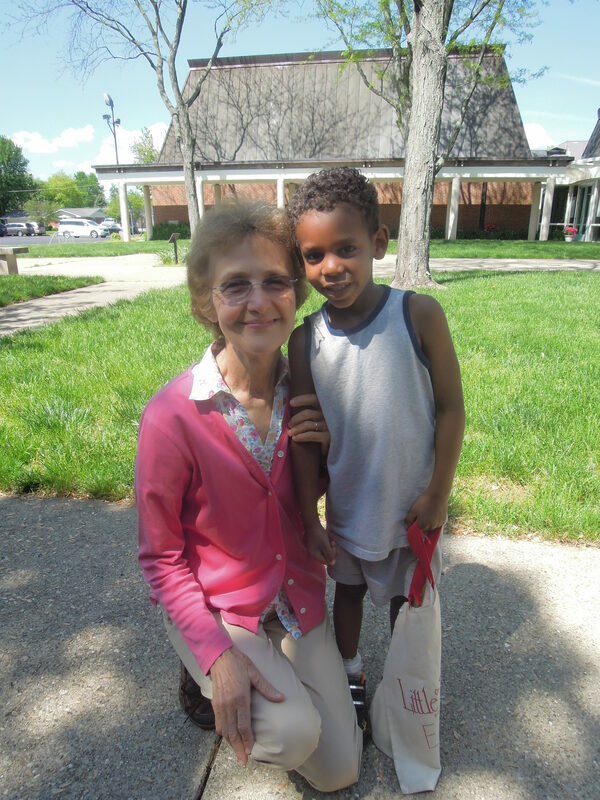 Here is Emet on his last day with his teacher, Connie Radovanovic. Our firsts included the starts of the girls’ developmental and physical therapy sessions, which went well. Therapy sessions are held in our home, which is such a blessing! We did developmental therapy (DT) on Wednesday afternoon, and our therapist spent time with the girls together, and then individually, working with them on repeating words, taking turns, and I’m not sure what else since somebody had to watch the girl that wasn’t being worked with (the boys, mercifully, were invited to play at the neighbor’s). Physical therapy (PT) was Friday morning, and a bit of a rush. For this therapy, I need to be in the room interacting with the girls and the therapist so that she can show me how to play with the girls in ways that encourage them to meet the goals we’ve set for them. The therapist did say that Glory will need orthotics because her ankles are very weak and roll inward. However, while we’re still just moving toward crawling and Glory has other surgeries ahead, we’ll wait on orthotics for a while. 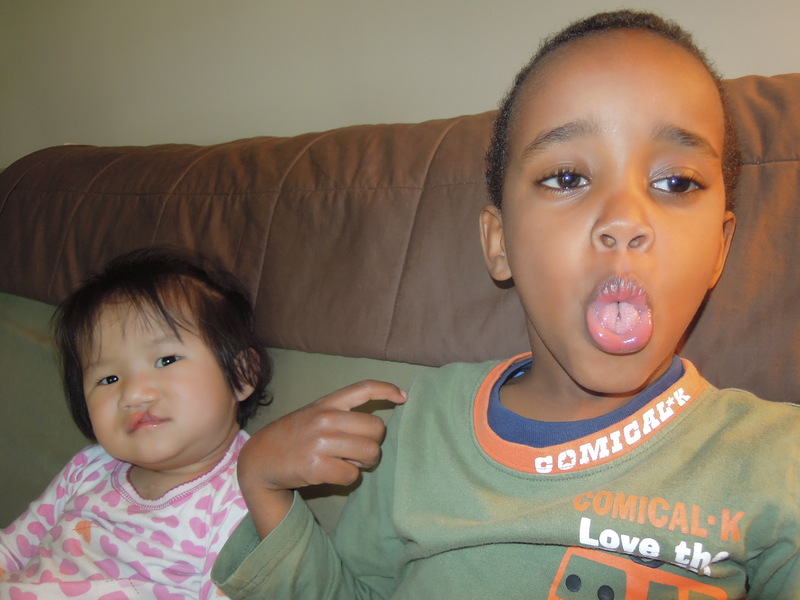 Glory’s new trick only just eclipses that of Jamin, who discovered last week that he can curl his tongue! He is the first of his siblings to master that wonder. 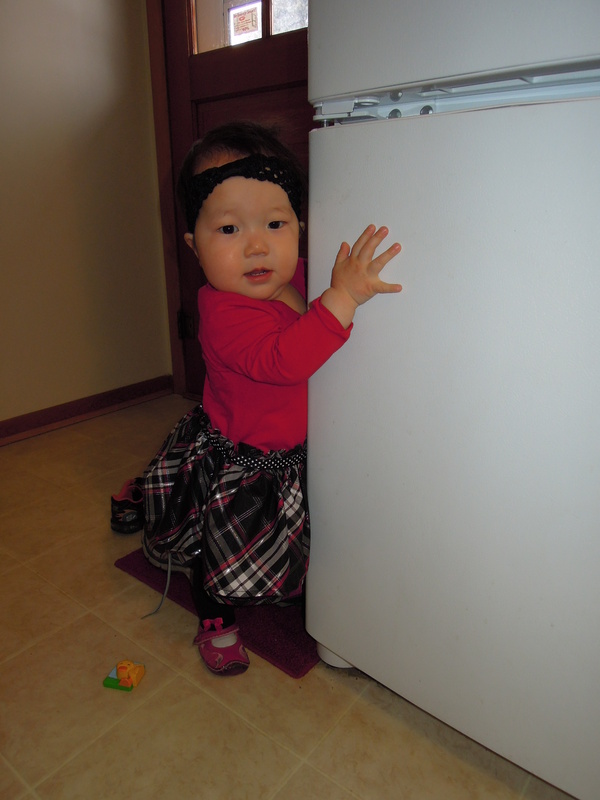 Aaand, Saige wore pigtails for the first time last week. And finally, today we remember the anniversary of a really big first 🙂 On May 13, 2009, we became parents for the first time. Here’s that post. PS- I called the ENT last week to see if he was available to clean out Glory’s ears when she has her hand surgery next Monday. We’re still, with hope, waiting on a response. Glory will have surgery in the next few months to repair her lip and remove her extra thumb. The same plastic surgeon can do both, which is wonderful! At the same time, an ENT will clean out (using a microscope) the very significant wax that is built up in one of her ears, and if there is fluid behind her ear drum, he will put tubes in her ears. So thankful all these procedures can be taken care of in one shot. She’ll require an overnight stay in the hospital, and will wear a brace on her arm for 3 weeks to keep her from putting her thumb in her mouth. Saige has torticollis, which means that the muscle on one side of her neck is tighter than the other side, which makes it difficult for her to turn her head. This condition has contributed to her positional plagiocephaly (flat head), which will not be reversed as her skull has hardened. Physical therapy will, however, help to loosen her tight neck muscle, and hopefully help prevent future neck-related issues. Both girls showed mild hearing loss, Glory’s rated as mild to moderate. This could be due to fluid behind their ear drums, so we will recheck them when their ears are healthy. 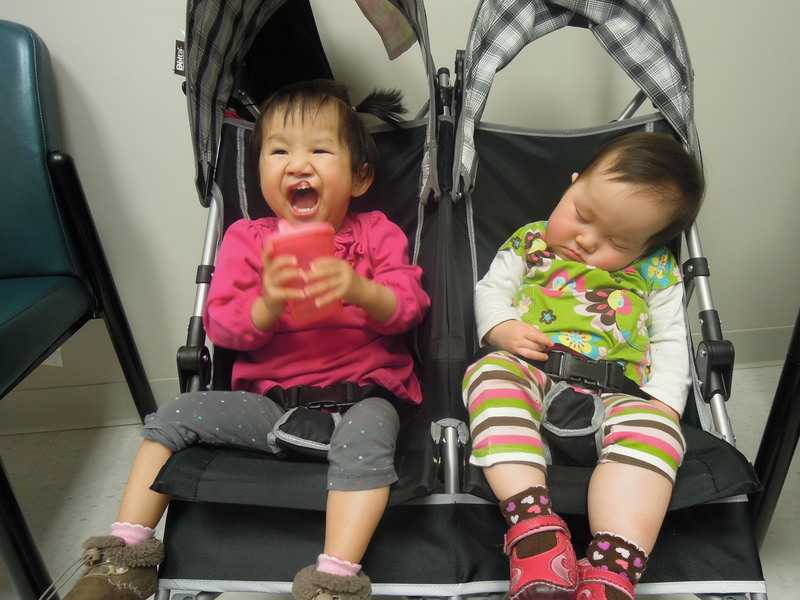 Saige is a long way from needing tubes, but Glory could need them soon. We’ll have to monitor their wax situation, as it can affect hearing and speech development. If too much wax builds, it will have to be removed with the patient under anesthesia. Both girls will see a hand surgeon on Friday, although we expect to have the plastic surgeon take care of Glory’s repair. Saige will see a physical therapist for and evaluation for her torticollis, and we will learn how we can help her at home. I plan to have First Steps, Indiana’s Early Intervention program provide physical therapy for us in our home, but as the evaluation process can take some time, we will take advantage of our time at Riley to begin working with Saige’s neck. Glory weighed in at 20 lbs today! That’s up 13 oz since the 11th, and means she gained over 3 lbs in February alone. So, so thankful for her continued growth. Neither girls has cavities, and we can count on braces for Glory! Crowded baby teeth mean crowded adult teeth! I think that wraps up the results of our visit. But there is just one story I don’t want to forget. Our first appointment was with the pediatric dentist, who had a visiting Chinese dentist with her for the exam. Jesse, noticing the Chinese doctor’s lab coat had Chinese on it, began chatting with her in Mandarin. She asked questions about the girls, and wanted to know if they spoke Chinese. We told her neither spoke it, but both understood it. Glory, who always seemed to calm down when we used Chinese with her, listened to the doctor as she spoke to her. But while the woman was talking to Glory, Saige got upset! She began to cry, and twisted around in my lap to put her back to the Chinese woman. She clung to me as I told her over and over not to worry, and that she belongs to us, and that she is safe. Saige cried at other times today, but not when a doctor wasn’t touching her. That was reserved for the woman speaking the language she knew from the place she didn’t want to go back to. Her cries spoke volumes! She loves us, too. Yay! We’re done with appointments for the day! Wahoo! Zzzzzzz……. I’m always meaning to write sooner, but life happens, and then there’s more to write about. Glory is growing, developing and changing. It is an amazing thing to watch! She had her 2 year appointment on Monday, and she has gained over 3 lbs since coming home. She’s up to 19 lbs 3 oz. 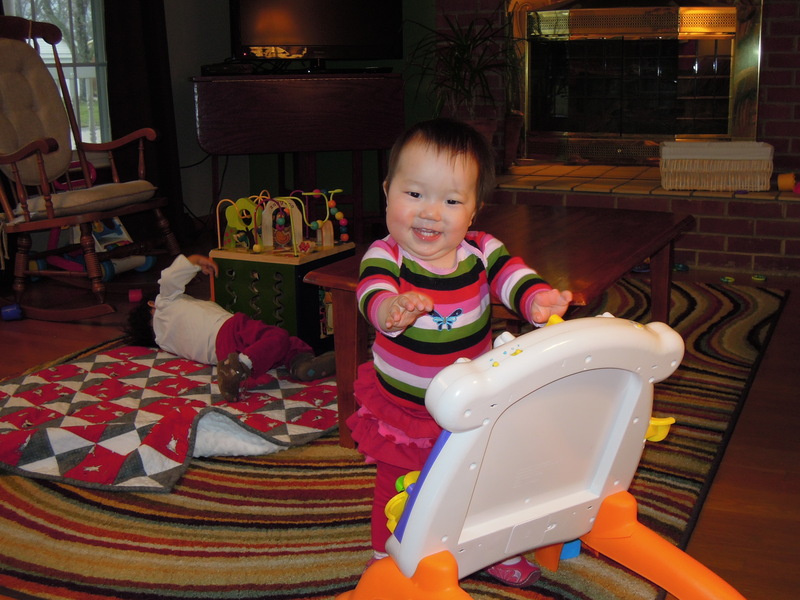 What makes this even more incredible is that she weighed just 16 lbs 9 oz when we were at the adoption clinic on Feb. 1. The girl gained over 2 lbs in 11 days! I ran into a friend visiting Columbus from Wuhan who saw Glory before we came home, and she went on and on about how good she looks, so it isn’t just me that sees this miraculous transformation! She found these glasses in the basement, and loved them! Standing at the side of the tub. In addition to growing more ticklish, she is growing in mobility. Two weeks ago Glory began ‘inch-worming,’ where she props herself up on her elbows and then throws them forward, then pulls her self forward back up onto her elbows. This week she added a little leg motion, is moving quicker, and able to get herself into trouble with her new mobility (she pulled a wooden puzzle off the coffee table this week, and it left its mark under her right eye). This week she also figured out how to go from a seated position to her tummy, without getting a bonk on the head. Today I saw how she does it- she walks forward on her hands, spreads her legs out into the splits, kicks them backwards, and ends up on her tummy with whatever she was reaching for in her hands. She spends most of her play time on her tummy now, and will choose to move toward a stack of books over a basket of toys. That’s my girl! Glory can now stand when she is leaned up against a table or chair, and will kneel to play for a short time. She will pick up her feet and ‘walk’ with assistance, and she claps for all her little accomplishments, as well as those of her sister. While she says neither “Mommy” nor “Daddy,” she imitates the sounds and rhythm of “light on,” because this little girl loves light! The brighter a room is, the better. Praise God, she’s not afraid of the dark and sleeps well without even a night light, but once she’s awake, she wants it bright. And it’s even better if she’s the one that gets to flip the switch. In other health news, Glory no longer seems to need the breathing treatments she was receiving as a result of her RSV and hospital stay in early January. This frees up untold amounts of time! She is drinking two bottles of formula during the day, so that takes up a bit of this time, but I’d rather be feeding her than holding her still enough for the treatment. The thickened formula is probably most responsible for Glory’s wight gain, but she is also doing a better job of chewing so she’s taking in more food. She’s still not fond of veggies, so I’m supposed to try fruit and veggie smoothies, but I’m just not sure how to fit yet another food prep and clean up into our day. We’re headed to the craniofacial clinic at Riley Children’s Hospital on the 25th, and looking forward to meeting with that team. The appointment will take all morning and we should leave with an appointment to have her lip repaired. It’s funny, I forget that she even has a cleft. She’s been drinking well with a valveless cup, only spilling when she wants to, which she often does. And her smile is just so precious, I will miss it as it is now. She’s such a beautiful girl! I feel like it is more difficult to know who a child really is and what they struggle with until they are mobile. Maybe that’s just because I’ve never had to wait very long for my kids to become mobile. But mobility gives us the opportunity to see if a child will stop when she is told to, or where she will go and what choices will she make while she’s there. With Glory’s increased mobility and strength, we are seeing greater determination in her. When she’s mad, she’s no longer the silent-crying, still, wounded little girl she was. Now, she storms when she has been offended! She can cry longer and louder than before, and uses her whole body to thrash when she’s angry. And while that isn’t behavior we encourage, we are encouraged by this evidence of her growing strength. Another development in her character and attachment are that she wants me sometimes now. Don’t get me wrong, Daddy is still very much the best, but at church last Sunday while I was walking with Saige in the back of the sanctuary, Glory was watching me, looking for me, and keeping her eye out for me. And one night this week, Jesse was taking her to bed, and she leaned out for me, wanting me to put her to bed instead of Daddy. It was a momentous first. It blows me away that we are just a week away from her 2nd birthday (the 24th), two weeks away from her 3 month as a Magnuson mark, and just a few more weeks away from the anniversary of the date we first came across the picture of our then daughter-to-be. To say we feel blessed is an understatement. Glory is a great gift. It has been quite a while since I first posted about our struggles with Saige. I just reread my post and am amazed at how far she has come. I thank God for His goodness to us! Most of our difficu lties seem(ed) to stem around food. That is still true. However, I can’t remember the last time Saige screamed to get food. As she would throw a fit as I prepared our meal, I would hold up fingers for her as I counted to three. If she did not calm herself down while I counted, I would explain to her that is is not ok to throw a fit and scream while waiting for food, and then I would take her to her room and put her in her crib. After a few minutes (of continued screaming, more likely than not), I would go get her, put her back in the high chair or exersaucer or floor, wherever she was sitting before, and give her another chance to wait patiently. We would repeat this as many times as it took for her to wait without screaming. Now that she doesn’t scream any more, she whimpers, and we are using the same technique to teach her not to whimper and whine while waiting. She can usually compose herself with the count of ‘1,’ and it sort of makes me laugh to see her eyes get big as she does all she can to avoid being put in her crib. Just this week, she has been quiet through the prayer before meals, even without milk in her hands at the time. We are really proud of her! She is doing really well health wise. We took the girls to Riley Children’s Hospital’s International Adoption Clinic to see Dr. Keck yesterday, which was really good. We’re going to have Saige checked out along with Glory at G’s craniofacial appointment at the end of the month to make sure both sides of her face are growing at the same rate, and she’s got an appointment with a hand surgeon as well. Perhaps surgery would allow her greater mobility in her left hand. Tonight she is sleeping in permetherin cream to treat her lingering scabies, and today we submitted her stool sample to the lab which I expect to reveal giardia. She’ll need an eye exam in the near future, too. As far as attachment goes, we see her clinging to us in new environments and preferring us to anyone else. She is comfortable crawling around the back of the sanctuary during church, but is still hesitant to be held by anyone else. She makes good eye contact, gets excited when Daddy gets home from work, and is concerned about being left out if I have any other child in my lap. When we walk into the girls’ dark bedroom at night to put them to bed, she lays a big, wet, open mouthed kiss on both Mommy and Daddy, whether we’re ready for it or not! Her Daddy will spontaneously say, “She’s a sweet girl,” and smile really big while he says it, and I’ll agree, whole heartedly. She’s doing well, and we couldn’t be more grateful.